It’s time to start our regular Friday reviews of the Demonstration Garden! We have more growing in the garden than some years at this time. 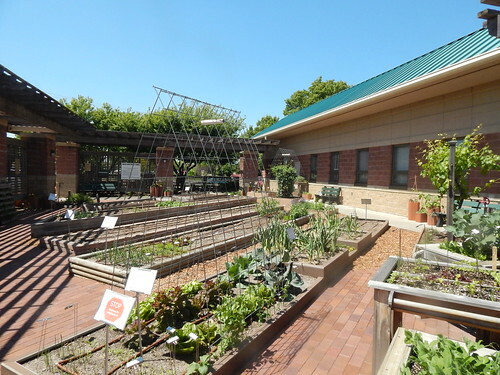 Except for the tomato and vertical gardens, which are empty, most of the other areas have lettuces, other leafy greens, peas, or root veggies. We had our first harvest of many of our leafy greens this week. This is the Elegance Greens Mix from the Grocery Garden. It got a little bigger than I prefer for salads, but we will be trying to stay on top of harvesting moving forward. Watch for harvest updates and track our produce value from the Grocery Garden as the season progresses. The green sprouting broccoli that is in one of our barrel planters has enjoyed the cool weather and is looking great. It isn’t showing signs of heading yet, but I expect it will be soon. Another boon of the cool weather is that the cabbageworms aren’t around either! In what may be the first live demonstration of the challenges of growing heirlooms, this ‘Brown Dutch’ heirloom lettuce in the Colonial Garden is already starting to bolt. It is most likely reacting to the temperature fluctuations from warm to cold. But for whatever reason, this variety is not as tolerant to that and more prone to bolt. The pallet garden we planted last year to strawberries is back up and growing. It is flowering and setting fruit. I don’t love the fact that the plants are so small. I think they are probably showing the lack of nutrients available to them in the pallet, and I don’t know that fertilizing right now is going to improve the fruit. It will be important for plant health if we want to keep it going for next season though. Now…how to fertilize and keep the nutrients where we put them? Ah, the challenges of pallets! The Japanese bunching onions and carrots that we overwintered were harvested this week. The carrots weren’t in great condition. I think that overwintered carrots are best harvested in January or February, before it starts getting too warm! Our poor tomatoes, peppers, and eggplant are still waiting to be planted. It has just been TOO COLD. With the early, warm temps 6-8 weeks ago, we started thinking early spring. But the reality is that the temperatures in the past two weeks have been too cold for these plants to be outside without suffering cold injury. We are hoping to plant tomatoes this next week and the peppers in two weeks.